Face wipes have been popular for years. I remember buying into the hype only to suffer an allergic reaction. In hindsight it’s not surprising that I did as they are full of nasty ingredients (same can be said for baby bum wipes). I know there are natural alternatives on the market but I have not felt the need to try them. I understand why people like the convenience but I prefer a proper cleansing with water. 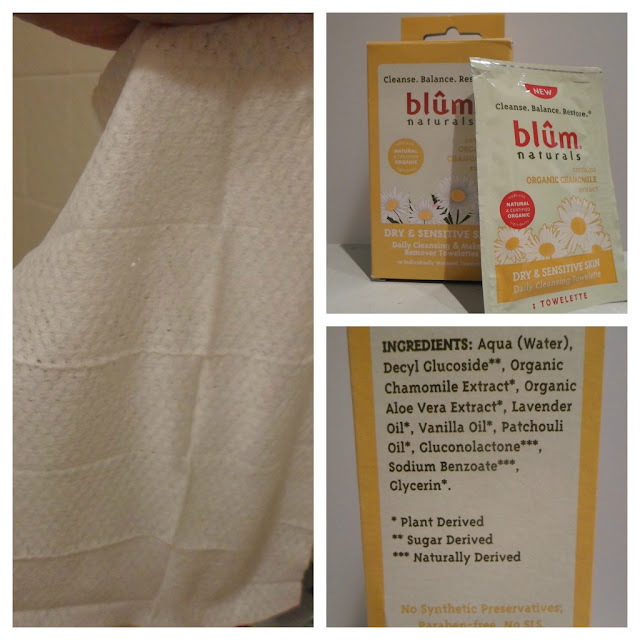 When Caitie (naturalla beauty) included Blûm Naturals Towelettes in our beauty swap I was a little sceptical. I have the Dry & Sensitive, individually wrapped wipes but they are also available for oily/combination and normal skin types plus a pro age and exfoliating version. The wipes are free from synthetic preservatives, parabens, SLS and alcohol. They are not tested on animals, PH balanced and hypo-allergenic. I find the wipes are a good size and have a soft texture. I initially thought they would not do much as they feel a little dry but they work very well. The fact that they are not too wet means no residue is left behind. The fragrance is a nice gentle hint of chamomile. My skin feels normal after use, never dry or tight. It appears to remove my foundation well as I end up with a grubby brown wipe. I like to use these as a quick cleanse after work or before jumping in the shower but I always follow with a proper cleanse. I do not think I could use these daily in place of my cleanser but I can see them becoming a handy travel bag item. I have found Blum towlettes available in UK, at Cocktail Cosmetics, priced at £3.95 for 10 individually wrapped. If you are reside outside of the UK visit Blum's website.